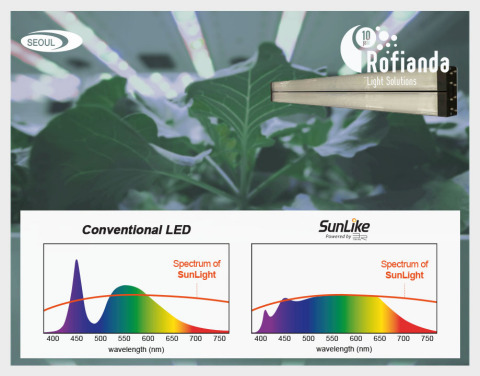 Seoul Semiconductor Co., Ltd. (KOSDAQ 046890), a leading global innovator of LED products and technology, announced that its SunLike Series natural spectrum LEDs have been adopted for horticulture LED lighting by the lighting solution company Rofianda B.V., located in the Netherlands, the second largest agricultural exporter in the world. Rofianda B.V. is a lighting solutions company located in Tilburg, southern Netherlands. In cooperation with partners, it researches and develops lighting systems that reflect market demand and provide the best solutions for customers. Rofianda mainly delivers lighting for industrial and office spaces, greenhouses, indoor farms, parking and sports facilities. Based on a broad lighting portfolio, Rofianda offers differentiated service to customers from optimal guidance on the most suitable lighting solutions throughout the installation process. For more information, please visit https://rofianda.com/. Seoul Semiconductor develops and commercializes LEDs for automotive, general illumination, specialty lighting, and backlighting markets. As the second-largest LED manufacturer globally excluding the captive market, Seoul Semiconductor holds more than 13,000 patents, offers a wide range of technologies, and mass produces innovative LED products such as SunLike – delivering the world’s best light quality in a next-generation LED enabling human-centric lighting optimized for circadian rhythms; WICOP – a simpler structured package-free LED which provides market leading color uniformity and cost savings at the fixture level, providing high lumen density and design flexibility; NanoDriver Series – the world’s smallest 24W DC LED drivers; Acrich, the world's first high-voltage AC-driven LED technology developed in 2005, including all AC LED-related technologies from chip to module and circuit fabrication, and nPola, a new LED product based on GaN-substrate technology that achieves more than ten times the output of conventional LEDs. UCD constitutes a high color gamut display which delivers more than 90% NTSC. For more information, please visit www.seoulsemicon.com/en.